As far as paints go, latex really is the lesser of all evils as far as cleaning is concerned. Latex is far easier to remove than oil based paints, so if it happens to spill somewhere it shouldn't, like concrete, it won't be a big deal. There are different approaches for fresh spills and dried paint, but either way it won't take much time at all. Wipe up as much of the spill as possible using old towels or newspaper. Mix detergent and water. Use a scoop of detergent per gallon of water. Scrub the area with the soapy water mixture and a soft bristled brush or a cloth. Rinse the area well with clean water and allow it to dry. Scrape away as much of the paint as will readily come off with a paint scraper or razor blade. Apply paint stripper or acetone with a brush per the manufacturer's instructions. Scrape away the remaining paint using the help of the paint stripper or acetone to soften it. 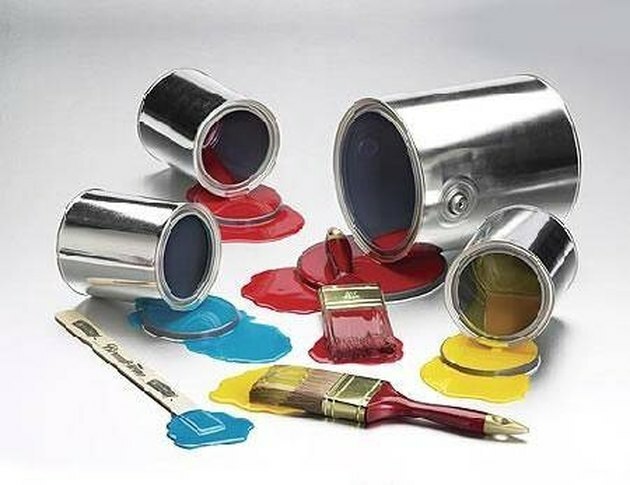 Allow the area to dry and dispose of any residual bits of paint.